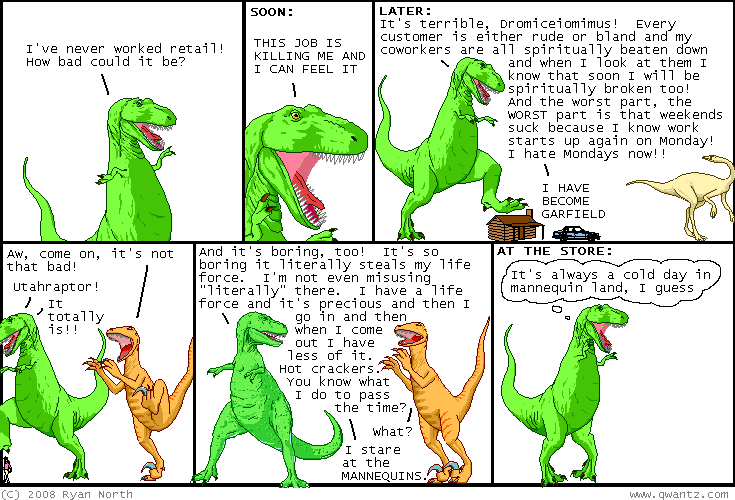 Dinosaur Comics - February 6th, 2008 - awesome fun times! –Luckily the answer is super easy and they should have come up with it sooner! February 6th, 2008: Doondie_man, has, like, an eBay store? Where he sells designs ripped off from other people? And if you click that link you'll see how he stole my A Wizard Has Turned You Into A Whale shirt by literally just taking the image off the website and putting it on a shirt. And he's printed about 60 of them and is selling them for more than what they cost on my site. Thanks, Doondie_man! You are why people don't like other people. I made an LJ post about it here with a few more details and pictures.